Craving Peking duck? 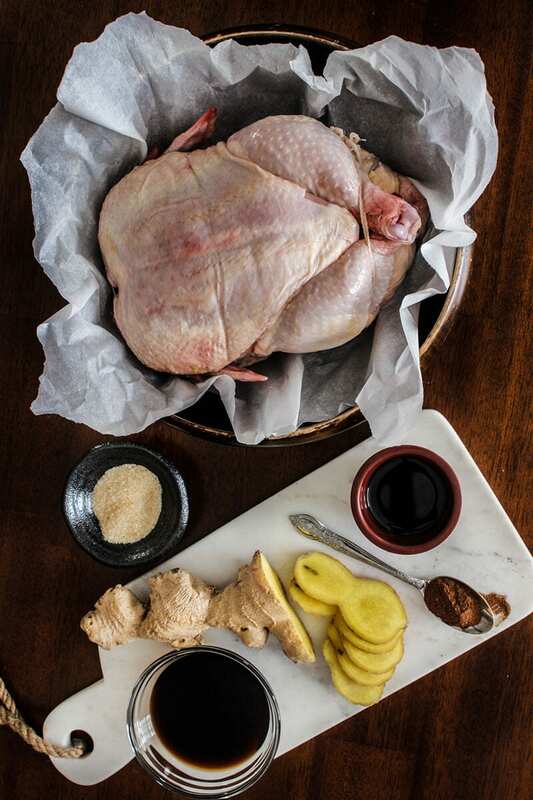 This recipe for creating chicken in the same style aptly melds roasted chicken with Peking duck for a main dish that goes above and beyond fabulous. Hi I’m Joyce, and I am the recipe developer and photographer behind the food blog Pups with Chopsticks, a website where I share my tried and tested Asian recipes! When I’m not eating, or playing with the dogs – I like to spend my free time creating comfort food, traditional and fusion Asian recipes in my small kitchen! I love experimenting with international flavors and ingredients, hopefully I can inspire you to do the same at home too! Love cooking whole chicken? Me too! I prefer it because in one cooking session, I have enough chicken leftover to toss into stir-fry, noodles, fried, rice, or even things like nachos and salads. There’s no complicated procedure to it either. With this recipe, you simply marinate it, pop it in the oven, and voila! It’s done. But what do you do if you’re craving Peking duck? Sure, you could go to the takeout place around the corner, but you promised yourself you wouldn’t go out to eat until the weekend. And you’ve got a whole chicken just sitting there. Duck isn’t always on-hand like chicken in my kitchen. 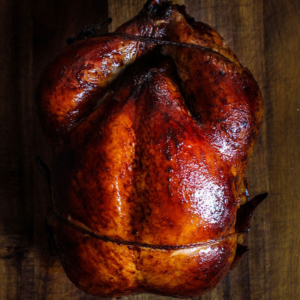 And that’s where I got the idea of making a whole chicken in the same style as a Peking duck. Dark soy sauce is something you might not have in your cabinets. It’s just less salty, darker, and a bit more syrupy than regular soy sauce. You can get by without it but you’re not going to get that brown color skin that Peking duck is associated with. You’ll also need ginger scallion sauce. Incidentally, the leftovers from your Peking chicken will also give you leftover ginger scallion sauce which you simply must add to your rice. You’ll never want it any other way again! These steps are much like what went down in this recipe for Sweet and Sticky Chinese BBQ Pork. The key difference here is that we’re using an oven, not a grill/smoker. This is not as complicated as it looks. In fact, in just 4 steps, you’ve got it! You’ll add a half-teaspoon off five spice inside your chicken and then add the marinade ingredients into a trusty zippered bag, or even a large bowl. Add the chicken and then marinate for no less than 4 hours in the fridge. About 30 minutes before you plan to cook it, take the chicken out of your fridge. Take the ginger slices from the marinade and put them inside the chicken. Remove the chicken from the fridge 30 minutes before putting it in the oven. Stuff the ginger slices that you used for marinating into the chicken. Get that oven up to heat and put it in a pan with a rack so the airflow to the chicken will give it that crispy skin. Pro tip: use balls of foil if you don’t have that kind of rack and shove them under the chicken to create the same effect. Take that leftover marinade and cook it on the stove top with honey or pure maple syrup added just before finishing. It thickens and sweetens it up. Every 20 minutes for the entire first hour you’re roasting that chicken, use a brush to baste the chicken with its own drippings. Once that time is up, start basting it every 10 minutes with the sauce you prepared. Your chicken should have oil drippings, but don’t panic if it doesn’t. You can simply add a tablespoon of oil yourself and baste with it. Not sure if your chicken is done? I think if you’re ever cooking whole chicken or large roasts even, a digital meat thermometer is a must in your kitchen. You’ll never have to wonder if you’ve got it cooked enough. You’ll want to insert it at the thickest point. On a whole chicken, it’s the thigh. I highly recommend a digital meat thermometer to take the guessing game out of how long to cook meat. Insert the digital thermometer at the thickest part of the chicken, which is usually the thigh. You want to take it out of the oven when the meat thermometer tells you that it’s 165 F or 74 C. Generally, it should take an hour and a half at 350 F degrees, but go with your thermometer’s reading for safety. Leave that chicken alone on a big plate for 10 to 15 minutes so the juices go back into the meat. Trust me! Once you do, you can carve it up and enjoy the deliciousness! Lightly dust the inside of the chicken with 1/2 tsp of five spice powder. Remove the chicken from the fridge 30 minutes prior to cooking. Transfer the chicken from the ziploc bag to a big plate. Remove the ginger from the marinade and add it to the cavity of the chicken. Reserve the marinade for cooking the basting sauce. Transfer the leftover marinade into a small pot. Cook it on the stove stop over medium-low heat for 5-10 minutes. Add the maple syrup (or honey) at the end and remove the pot from the stove. Set aside for basting the chicken at the end of baking. After 20 minutes, you should see oil drippings. Baste the chicken with the oil every 20 minutes or so, for an hour. If you don’t get any oil drippings, you can use 1-2 tablespoon of oil. For the last 30 minutes, start basting it every 10-15 minutes with the basting sauce. Note, make sure to close the oven door every time you’re basting the chicken, to prevent the oven temperature from dropping too much. The total baking time can range from 1 hour and 20 minutes (for a small chicken under 3 lbs / 1.4 kg) up to 2 hours (for a big chicken that’s 5 lbs / 2.3 kg). Remove the chicken when the internal temperature hits 165F (74C). If you don’t have a thermometer, slice the skin between the chicken thigh and body cavity. You should be able to pull the thigh easily from the body and the chicken meat near the joint should be white. If the chicken is not cooked, return it to the oven and let it cook until cooked through. Once done, let the chicken rest for 15 minutes before carving. Serve the chicken as a main dish over steamed rice. Enjoy! To make the chicken gluten-free, use tamari or coconut amino to replace the soy sauce. 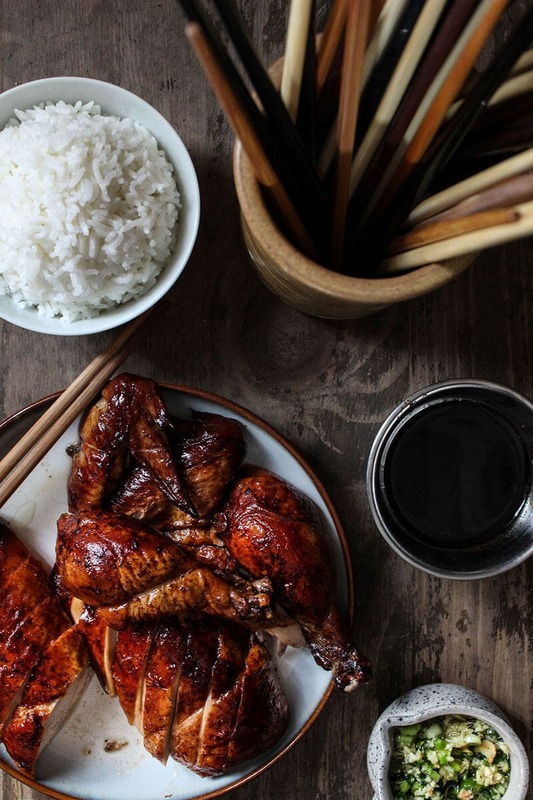 Dark soy sauce adds an appetizing caramel color to the chicken. 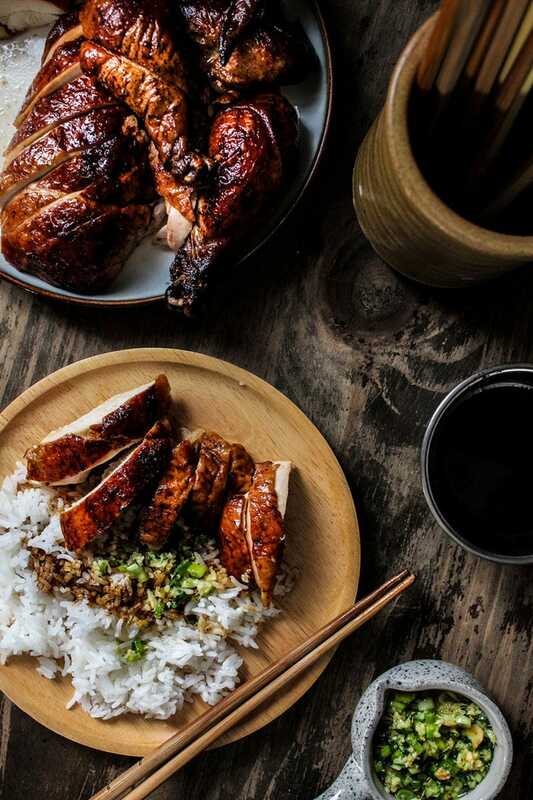 You can use soy sauce instead if you don’t have dark soy sauce, but the chicken will have a lighter color once cooked. 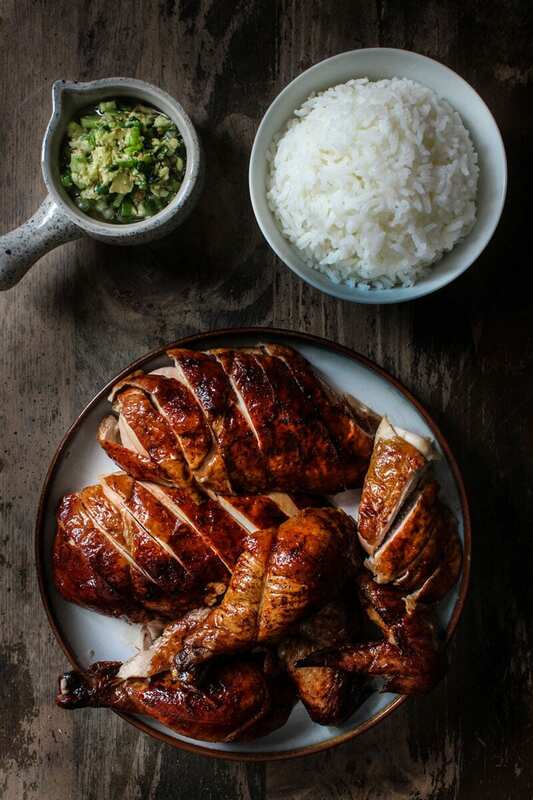 This chicken pairs amazingly with Ginger Scallion Sauce. This was easy and unbelievably good. I roasted the chicken last night and am making the ginger scallion sauce today. I realize I used regular soy sauce instead of the dark so mine isn’t as dark as yours. It was, however, perfectly (completely) done, tender, juicy, and delicious.Thanks for your recipe!! Can I use this recipe for Peking Duck? What modifications would be needed? What are the directions for trussing the chicken? I LOVE this! Peking duck is one of my favs, but you’re right, I don’t usually have a duck lying around. Love that I can make the same flavors with chicken! Made this for Christmas Eve dinner – excellent. Followed the recipe, marinated for 48 hours and cooked via rotisserie. Enough left over for chicken-veg rice bowls on Christmas night. Still trying to achieve that crispy rice on the bottom of my rice bowls – missed again – any suggestons? Love your recipes a lot! I have seen your Peking Duck recipe and low-temperature cook duck recipe, so just one question: Is it possibe to make Peking Duck with the low-temperature baking way? Will it be still be crispy when baked under 95-120 degree? Or we must bake it under 180 degree to get the flavor of Peking Duck? Hi Huiyi, I would love to give it a try. To speak the truth, I’ve been reluctant to create a whole duck Peking Duck recipe, because the authentic ones are so special and cooked in a high-temperature oven (higher than the home oven). Instead of rendering off the oil to get crispy skin like my slow roasted duck, the authentic Peking duck skin is thick, yet super fluffy and crispy. 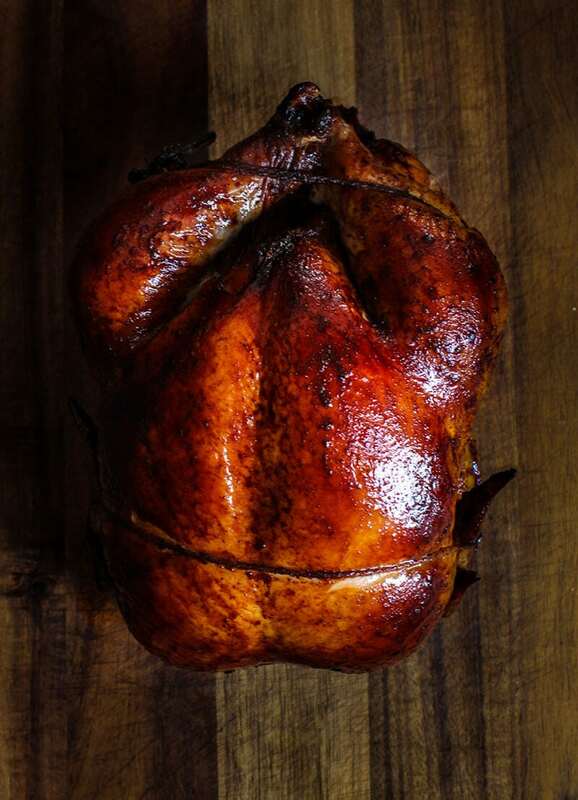 That is the result of the high cooking temperature and short cooking time, plus it uses a technique to blow air between the skin and the duck to separate them. All of which are very difficult to apply in a home kitchen. I’m originally from Beijing and I’ve had some of the best Peking duck in the top restaurants, so I’m very intimidated to recreate the recipe. That’s being said, I’d love to try the slow temp method and capture some of the essences of Peking duck in my kitchen. I would definitely try the lower temperature (95 to 120 C) instead of 180 C, because it renders more fat to get the skin crispy without overcooking the meat. If cooking at a higher temperature, the skin might still taste too fatty.